I always begin my library lessons with a "Mrs. Collazo is currently reading..." PowerPoint slide. The slide features the book cover, genre, Goodreads rating, and a little something about the book. It is on as the students come in, and I love hearing them talk about the book before I've even started the lesson. So last week, This Is Not A Test was on the "Currently Reading" slide as my ninth graders filed into the library. Even before I opened my mouth to talk about it, I already had students saying "I want that one!" or "Can you put that on-hold for me?" The key word on the slide that got them talking: zombies. Yep, it appears my students want more zombies in their lives! SUMMARY: Sloane Price is depressed and suicidal. After years of abuse from their father, Sloane's older sister Lily has run away and left Sloane behind. Now, Sloane only plans her death...at least until death comes charging through her living room window. A zombie apocalypse has begun, and now Sloane has managed to find temporary shelter in her high school, along with five other students. They are all survivors, but can they outlast the zombie horde waiting just outside the walls? REVIEW: I love zombie books, but I haven't read one in forever. The last zombie book I reviewed was Jonathan Maberry's Rot & Ruin, way back in 2012. I can't believe I've waited six years to read another one! This Is Not A Test builds slowly, and some readers won't like that for a zombie book. Zombie books are necessarily action-packed, run-for-your-life thrillers. In zombie books, character development may take a backseat to nonstop action. But zombie gore, perilous danger, and character development can live in harmony. Rot & Ruin has fantastic character and plot development, so much so that I actually felt sorry for the zombies. Unlike Rot & Ruin, the zombies in This Is Not A Test receive little to no sympathy from the author or the characters. 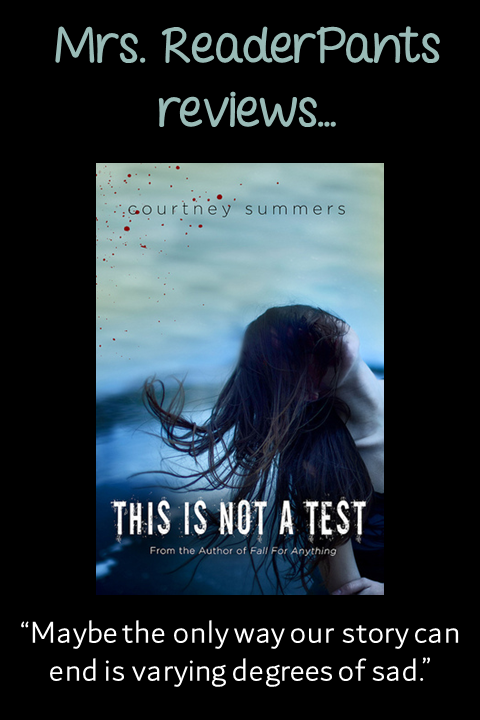 Instead, author Courtney Summers focuses more on developing the six high schoolers trapped inside their high school. All six have a story before the zombie apocalypse. Sloane and Trace are especially well-drawn, complete with psychological problems and abundant personal flaws. I love that Sloane's history of abuse and contemplation of suicide actually help her survive. And I was just so ready to strangle Trace with his emotionally-charged outbursts and attempts to control other people. If I were analyzing this for English class, I would say that Trace represents a young version of Sloane's abusive and controlling father. Despite a slow build, there is plenty of zombie action to be had, particularly in the last half of the book. There are some shocking moments where I covered my mouth or gasped audibly while reading. It is difficult to put down in the last half, so be sure to allow yourself time to settle in for the ride. If you start reading the second half at, say 9:00 on a school night, you may find yourself quite tired the next day. You've been warned! One complaint: What has happened to the sequel? There is a book called Please Remain Calm, but it is only 96 pages and, according to Goodreads, is called This Is Not A Test, book 1.5. Goodreads does not list any further sequels. THE BOTTOM LINE: A zombie story for patient readers who love good buildup. STATUS IN MY LIBRARY: I am so sad to say we don't have this! I have just ordered it and expect it in two weeks. It inspired me to do a zombie booktalk for that 9th grade class next week. Side note: Rot & Ruin has a book #6 coming out in December 2018! I LOVE the idea of having my current book up on the screen for students. I work in a 4th-8th so may have to adapt some of my books or just do this method for my 7th/8th grade classes. Awesome idea though, thank you! It's so great! When I was elementary, I would always read something from our library shelves along with whatever else I was reading. The book is in-progress, so I don't have to have finished it to talk about it. Even if it takes me awhile to read, it's good for students to hear about my reading process--that I don't always love it, I don't always get into it quickly, and I do sometimes abandon. And that all of that is just fine for any reader, including me and them.